As of late, a lot of change has appeared in my life. Not in dramatic forms of being cured of feeling well in myself. As my luck would have it, I have unfortunately spent the entire time period of May and June completely bed bound. Despite this setback, I am seeing positive changes despite the situation which is incredibly uplifting for my spirits. Change has appeared in my personal life due to the fact that I am requiring a lot more help with day to day tasks, yet this has been the best form of change for my quality of life and is something to rejoice over. I'm feeling stronger despite being physically at my weakest point. One major change has been to choose happiness and positivity as an everyday commitment. Although difficult and a tough balancing act, this has been incredibly beneficial to my personal growth and I hope that this is a sign of better days on the horizon. I've seen changes in a short period of time all thanks to changing how I view my circumstances, my position and my lifestyle and this has certainly put an incredible amount into perspective already. During this time of change, I felt the need to limit my time spent on my chronic illness, social media platforms. I reduce social media intake whenever I need to focus solely on myself and my health journey. I knew that this would be incredibly good for the soul in order to truly work on and upkeep any form of positive change I have made. Through social media, I have actually met some incredible people as well as making what I hope can be, life long friendships. However, social media as of late seems to be turning chronic illness into a form of unecessary competition. Something that makes me feel slightly panicky inside because we really do not need the extra problems on our seemingly full plates. Where has this surge of competition appeared from? I reflected on how negative the chronic illness community is becoming when I eventually began scrolling aimlessly down my feed again. I admit, we are incredibly lucky to live in an era where we are chronically ill, yet we have been given the ability to connect so simply through forms of social media. It has spared many of us from feeling despairingly lonely and distressed in our indivial circumstances. However, we can not forget that social media only ever shows the tip of the iceberg in an indivuals life. Social media shows us a completely different point of view that allows us to over think and over analyse our own lives. It either promotes complete honesty or dictates a fantasy approach within our lives. An edited highlight and 'best of' reel. It is an incredibly contorted form of imagery of what we wish to impose upon the public domain, whether that be from a positive or negative viewpoint on our behalf. As of late in the chronic illness community, it seems as if there has been an infatuation of hospital ward photographs, negative posts and limited forms of clarity shared on social media. I have been leaning towards the positive pages because that has supplied me with more hope than my regular feed. It is not the place I once seeked desperate solace in to connect with others, just three short years ago. There are rude remarks, arguments, belittling and meddling. Many people are currently trying to prove how sick they are via social media. I completely get why it happens, we all have our down days and when they stick with us for longer than we would like, we feel completely broken in every way, shape and form. Our sadness spills over from our private lives onto our social media platforms without realising. Illness has tendencies to spill into every form of our life and we feel pretty helpless to its grip. Yet whilst doing so, many have taken on the approach of attacking those who appear to be having a better spell of good health. Firstly, you do not have to be in hospital as an inpatient to be truly sick. You do not have to have an ambulance called, to be truly sick. You do not have to spend the majority of your week bed-bound, to be truly sick. You do not have to be a wheelchair user to be truly sick. You do not have to put your life on hold completely, to be truly sick. You can still achieve, whilst being sick. You can still go to school yet still be sick. You can hold down a job, yet live with an illness. You don't have to be housebound in order to be sick and lastly, you certainly do not have to look sick to feel it. There are so many different walks of life where chronic illness is still very much a part of the major foundation. After all, our personal sickness and health issues are relative and damaging to us as individuals. You could take all the time in the world in attempting to explain every little detail of your health journey to someone and despite this, you would undoubtedly still be met with disbelief and questioning. Unless you have walked a certain path, you will not understand the trails and tribulations it entails or how it changes the lives of sufferers. Through this competing energy and stance, we are completely losing the true purpose of awareness when we try to out do each other. Sickness comes in different forms and that is so important to remember, just as important as remembering the principle of invisible illness. It is damaging for the chronic illness community to compete with each other over who is in fact 'sicker' or extra 'hard done by' in life. We need to remain united for the same reason. That reason is that we all hope to eventually reach wellness. We need to inspire each other without belittling. We need to motivate each other to push past our individual boundaries, without remaining focused on our own failures within illness. We need to look at each other's triumphs and think, well I might not be able to do that but I am certainly going to try something today that I could not try yesterday. It might be as simple as brushing your own hair or putting on a form of clothing to begin with. Provide yourself with a confidence boost rather than focusing on what you do not have in comparison to others. I have been there myself and small changes have made all the difference. 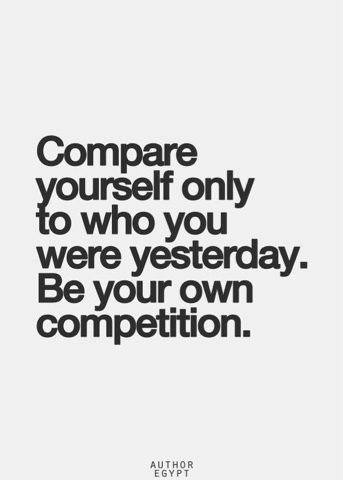 We are all so different and comparison is the thief of our joy. We are united in sharing a diagnosis but no two patients will ever walk the same path or feel identical forms of pain. Your journey is your own, plain and simple. You do not need to provide an explanation to justify your current situation in life, despite the fact that as human beings, we tend to do just that. There is no right or wrong in chronic illness,we are all granted a life and we all have different limits and capabilities, strengths and weaknesses. We all go about living with chronic illness in different ways, it is a case of trial and error. There is no textbook approach to living with chronic illness, nor is there a check list for what qualifies someone to be deemed 'chronically ill'. You ultimately deal with your chronic disease or disability through every passing moment. You do not have to prove your health adversity or how you choose to cope to anyone. We are all working towards to same goal here and we only fail each other through competition. All of our lives have been upturned because of chronic illness, we all feel that physical and mental burden of a diagnosis. We all remain challenged in our every day lives regardless of our different paths of diagnosis. Our goal as a chronic illness society is to reach our unique and individual version, of health and happiness. We want to raise awareness, but we need to do so in the best way. Ultimately, we want nothing more than to feel better or well within ourselves and we need to want it enough for each other too. Eventually, we hope for all of our circumstances to mirror this outcome. Progress is positive and uplifting for everyone, it proves it can be possible despite the intense circumstances of living with complex illnesses. It should not make us doubt ourselves and our bodies even more just because we are slightly bitter over our current circumstances or limitations. We should be showing each other that changes, big or small are possible if we take the time to bring them to the surface through acknowledgment. The constant symptoms our illnesses induce upon us can cloud our judgment on the positives in our life. We need to become compassionate to each other and show support, rather than questioning, interrogating or rivalry. We need to prove to ourselves that there is so much more to us as individuals than feeling completely defined and immersed by our physical pain. We are not our illness. Defining ourselves by our pain levels will never decrease this matter. The difficult parts of our life are certainly learning curves. They might break us to begin with, yet we hope they have the power to strengthen us despite this. If you have anything to celebrate within your circumstances today, whether it be that you achieved something on a small or large scale, please don't waste time in overlooking this positive achievement. It might have to ability to completely change the way you are looking at the circumstances within your life. You might not get the chance to celebrate your achievements tomorrow, so never downplay your abilities just because you think you have to fit the mould of chronic illness. Our health, nor the possibility of good days appearing to us in large quantities are not guaranteed to any of us. We should only compete with ourselves through this hardship and instead use our energy to support eachother through the good and bad times. 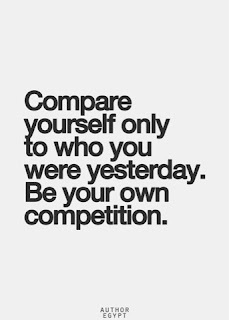 Comparison will forever steal our joy if we remain focused on fitting the chronic illness mold. Reluctant to share the good times because we fear that they should be a constant level of bad. You do not have to downplay your incredible achievements with negative underlines just because you think you are offending the chronic illness community. Shout your achievements from the rooftops because those who are living with challenging forms of pain understand how difficult any task in life can be. If you can provide one thing today, allow that to be hope to someone with chronic illness, that they can infact achieve these moments in life soon enough too. Excellent article! You mentioned several things that I too have noticed on social media. Choosing positivity is one of the most important things we can do. That doesn't mean we won't have bad days and our frustrations won't show, it just means that we have pledged to be more positive. Thank you for sharing and congrats on your article being picked up on The Mighty! I hope you don't mind, your article inspired me to create some graphic quotes for Twitter and Instagram. I will tweet them to you, if you hate them or it is an intrusion, just let me know, no worries. I really enjoyed your article :) So many good points! Thanks for tackling this topic! I agree with you that those of us living with chronic illness should just support each other throughout it, rather than working against each other in any way. I've never personally encountered these chronic illness competitions on social media, though? Are these specific hashtags on Twitter, or specific groups on Facebook? I'm curious! I also have a chronic illness blog! www.thechronicself.com It's pretty new but I'm already appreciating having a place to talk honestly about living with chronic illness. I'd really appreciate if you could check it out, and leave a comment. Thanks! If I remember correctly, I found this published on the mighty. I wholeheartedly agree with your perspective and the points you make, though one thing I've just recently realized (at least in the US) is that this mentality is a product of our health system. So many chronically ill people trying to live their lives and be positive, but a good number of these are also unable to work (in at least the traditional sense), and the process of getting assistance/disability is a brutal maze of proving how sick you are, which can last months or years. You have to rip yourself to pieces and convince a stranger that you are, essentially, worthless. None of your strengths matter, only what you cannot do. Should you be granted this help and make the effort to improve and get back on your feet, it's important to not post too many pictures of you out of the house, or doing too many "activities," or you can literally have your benefits taken away. There is no reward for improvement, and no bridge between complete invalid and complete independence. I hope you don't think I'm challenging you; I'm disgusted with this system that perpetuates a constant need to validate your own weaknesses if you want any help, and I think that paranoia results in the competition. There's already the image that 99% of people on disability and welfare are scam artists taking advantage of the system, and so I think people in the US feel this insecurity, like if they don't prove their poor health (to others, and themselves), then they are a fraud as well and maybe the help will go away. I don't know what to do about it yet, but it's broken - so very broken. And, your writing is lovely! Take care! i agree with the above poster and of course some points you made specifically about not expecting anyone to understand our path or pain and choosing to be positive. I do think there are some states of illness where implying we should be positive is unrealistic and perhaps oppressive in itself. Pain and certain pain meds literally erode our happy chemicals and society can sometimes erode what is left by making our journey more difficult. I never interpreted photos of being sick as competition. My sister is dying of breast cancer and posts picks from time to time getting radiation. It is a way for us to connect with her inner world and understand her journey better than we otherwise could. Usually she wears a tough front and I admire her for letting people see her weak moments in a shameless way. I'm a total advocate of positivity and happiness as a choice, but disagree that a 48hr hospital visit of intense suffering requires a positive spin. After a four day migraine ceased recently I did find deep appreciation in being able to re-immerse myself into the world. I can rarely get to the drs when this ill. This part of my reality is essentially just this subjective verbal presentation to drs working outside the hospital. Drs are trained to question the subjective until observed first hand. What if that is impossible? I've suffered from migraines since childhood. Later developing 3 other conditions that converge to make a unique experience with disability. Sharing aspects of my illness is admittedly sometimes driven by a need to explain to people that I am not just lazy and they only see me on my good days. Suffering alone in darkness has been my reality since childhood. Seeing suffering in others online made visible erases this invisibility and I must admit I see a positive aspect of these revelations despite my own privacy. I have never once interpreted this as a competition of illness oppression,but am not disputing this competitive spirit exists. I just haven't seen it other than between disability groups ie chair users vs non using parking permits, etc. I think there is value in honoring peoples need to vent, be visible and maybe be heard. I respect that many need the validation from their community in a world that is continuously devalidating us collectively. Just as criminality being associated with race is offensive, being a cheater or faker or addict seems to be the oppressive commentary towards those who are disabled. Maybe fighting back with exposure is an act of empowerment for some rather than identity and competition. That said, I might not be seeing the tweets you are responding to. I do know that if someone wants me to positive and cheerful after days of non-stop migraine, I would find it to be intensely unrealistic. Sometimes it is okay to feel despair and dark thoughts. We wouldn't ask a torture victim to remain positive. many of us are tortured by our own bodies and medical gatekeeper withholding of pain medication. There is no positive spin on some experiences, but instead greater joy in the moments of "lesser" suffering. Imo. Peoples intentions for posting are as broad as the shades of colors in the world. If someone is trapped in a world with no empathy and intense suffering, getting it from strangers seems more like a positive to me than a negative. I do think your article had many excellent points. I wasted lot of effort in the past trying to explain an experience to people they can never understand until illness knocks at their door. I also wish I stopped looking for validation on the outside much earlier. I agree that happiness can be found despite suffering, but I understand people who cannot find it. I have compassion for these people and think reflecting live onto them as a community will allow the need of empathy to be met. I would not want them to feel shame from their community for exposure. And medicinal marijuana and have lists of wellness tools. my task is to create deeper joy in my moments of less suffering to off balance the negative. I think as a community we can help others find these positive moments more easily by directing love and validation towards them when they feel bitter and joyless. If my sister read this blog she might be hurt and even embarrassed for posting her radiation pics. I would never want her to feel that. That said, I understand many of the points made in your blog and think I understand what you are trying to address.